Justin's WeatherTalk: Heavy Rain Friday, Snow Next Week? In this quick moving, very active pattern... yet another storm rolls through the nation's heartland. It's a track west of us that keeps us in the warm sector and no chance of snow. What's different between this storm and the once that just passed yesterday morning is it's stage in it's life cycle. Most mid-latitude cyclones, the Red 'L' you see on a weather map, has an average of 3-5 days to grow, peak, and occlude (close off and weaken). The last storm was in it's weakening phase when it's cold front passed MD, while this one will be reaching it's peak. The net result for us, more rain and perhaps thunderstorms on Friday. My new maps are posted on it's page. As the upper level pattern shifts it's trough of cold air to the east, another developing storm will develop and ride up the east coast. since we are still 5+ days out, the models have a spread of solutions. The GFS which I have shown a lot lately, actually has a coastal storm Tuesday night and Wednesday- just missing us... but I will focus on Monday chance today. 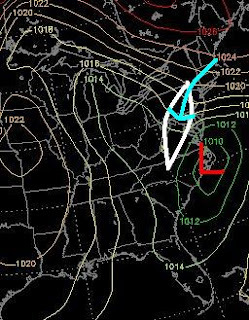 First, the Canadian (white background) shows a coastal Low on Monday morningwith most of the moisture oer the Delmarva into southern New England. We would be on the cold side with enough moisture for snow- but too early to distinguish if it's shave worthy. The ECMWF- European (black background), shows a surface Low with a 1008mb center strengthening in a good spot. That would also give us a chance for snow Sunday night into Monday. In honor of my buddy Tony- here is the Japanese Model for Monday... one that like to give us coastal storms, but does not indicate one here. Perhaps it is along the lines of the GFS which is trying to turn the following short wave on Wednesday into the coastal. Looking at some other parameters, there are least support for a a pattern shift. The NAO is trending negative. That would supply a blocking in the North Atlantic which helps us get coastal snow making storms. 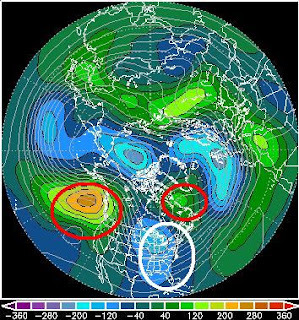 Below you can see the Northern Hemisphere 500mb from today to next Thursday. This level is the general upper air patterns that govern our surface weather. It is more generalized, but can highlight the heights here to show the warm and cold pockets. the white circle over the east shows the current warmer than normal conditions vs. next week's tough and cool down in 'blue'. 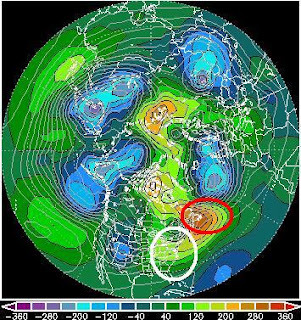 The developing block in the North Atlantic is highlighted in red, in addition to a developing Pacific ridge of warmer air. All signs of a return of winter for us. Note: It was last year , after 4 straight days in the 60s, winter kicked in on January 17th- and held on through mid March.